Country households seem to have a knack for combining the useful and beautiful to create comforting staple items that serve multiple purposes. As the child and grandchild of true “country folks”, there are many symbols of this resourcefulness that I cherish, and one especially dear is the calendar towel. Each year at Christmas time, the cotton gin sent local farmers their annual gift of a calendar towel, which was proudly displayed and used throughout the year to mark events and the passing of each month. As the year waned, the towel was repurposed to dry dishes and little hands, and became a soft, faded reminder of the special times shared within those months. A new edition was hung in its place the following year and the tradition married past and present in a useful, beautiful capacity. I carry fond memories of many such items, but few bring back the tastes and smells of childhood as poignantly as the classic stand mixer. My grandmother’s faithful mixer churned out many treats from its place of honor in her kitchen, and as a girl I imagined that one day I would be successful enough to purchase my very own and use it with love for my family. After exhausting my hand-me-down, garage sale find of a mixer, I got the mixer of my girlish dreams for Christmas one year, and have explored new realms of baking with glee. My beautiful new mixer now holds its own place of honor in my kitchen, and my children have informed me that they eagerly await the day that they are “old enough” to use the shining tool. As I pass on to my children the cooking and baking secrets my grandmother and mother taught me, I hope they, too find inspiration in useful, beautiful things. 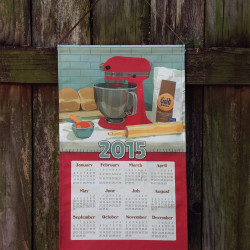 In its third year, the Richard Creative Calendar Towel pays homage to the beloved stand mixer and all of its inherent potential and meaning. I hope that you display your calendar towel in a place where you find inspiration to create something pretty and practical for those you love.